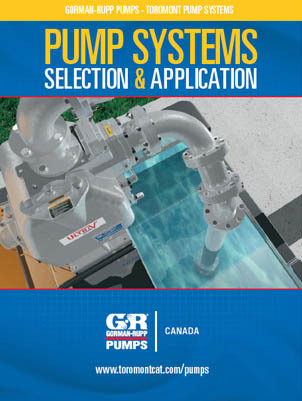 Toromont is an authorized dealer of Gorman-Rupp pumps, parts and service. Gorman-Rupp's extensive line of pump products include self-priming centrifugal pumps, standard centrifugal pumps, submersible pumps, trash pumps, priming assisted pumps, and rotary gear pumps. With superior performance range and durability you can rely on Gorman-Rupp pumps to help you get the work done – and with outstanding service and warranty, these pumps become an even more attractive option – contact Toromont today and get total peace-of-mind over the long run. This handy, easy to use guide lets you 'plug in' your own site conditions and pumping requirements so you can select the best pump for your application, physical conditions and goals. Download it for free by entering your primary email address and name in the form.